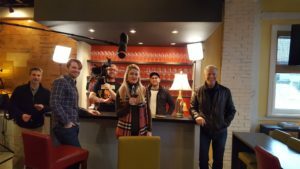 HGTV’s show ‘House Hunters’ were in Seattle taping episodes for their upcoming season. One of their production executives came in the shop, and loved our cozy wine bar. So much in fact, they thought it would be a great place to tape a segment of their show. The first episode featuring the Wine Outlet will air coming up on Wednesday, April 18th at 10pm.